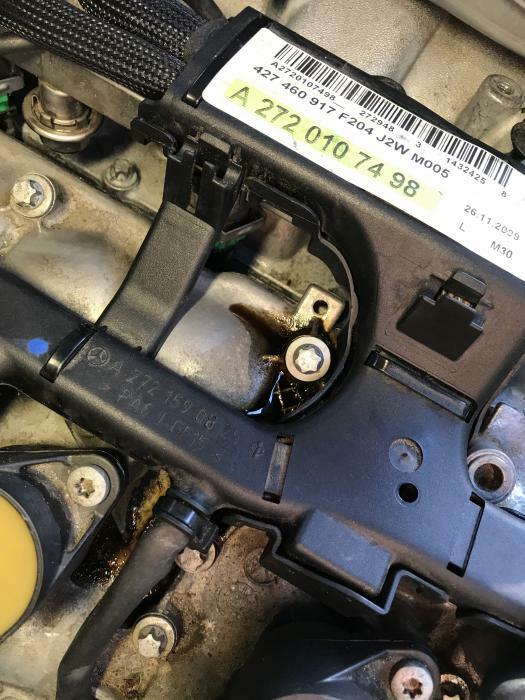 i just bought my wife this 2010 C300, and it runs great... but the previous owner decided to remedy the oil leak concealing its presence, so it's my problem now. we are experiencing the tell-tale oil dripping onto the exhaust, on the RH (passenger) side of the engine. i pulled the engine cover, and it's definitely on the side, not the rear. the cam plugs and breather cap are holding tight for now... at first i suspected the valve cover gasket, but after clearing everything off, it looks like the oil is coming out of the bolts that secure the valve cover. is that a thing? the oil seems concentrated at the bolts directly beneath the wiring harness just a few inches south of the oil fill cap. 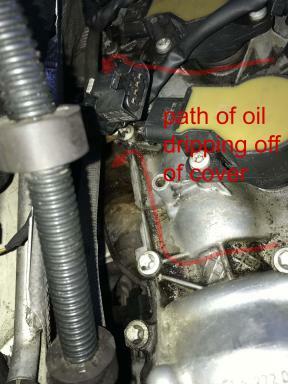 the oil is seeping down the valve cover onto the exhaust, but also over the other side toward the intake manifold. 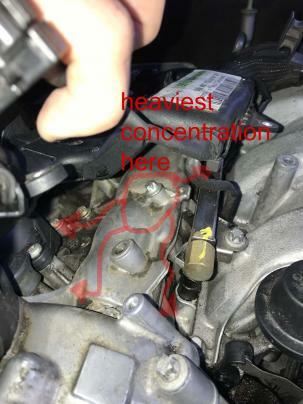 my assumption is that the valve cover gasket (if it was leaking) wouldn't defy gravity by traveling up and coming down the other side... i've attached some photos. well, i suppose i answered my own question... yes this is a thing. after cleaning everything up and running the car for 15min, attached is a photo of the result. i'm assuming that the valve cover gasket is what seals the mating points between valve cover and cylinder head? also, does this engine use grommets on the valve cover bolts, or is there an option to place a grommet as opposed to yanking the valve cover? i'm mechanically inclined to do the job, but i'm not very well equipped, my garage is full with other projects, my driveway is at quite a slope, and well.. it's just plain cold outside. Last edited by reverendalc; 12-30-2018 at 12:25 PM. well, as it turns out, the aforementioned bolt was barely more than hand tight. after torquing to 10nm and double-checking the others, it's ran for 30min without so much as a drip.